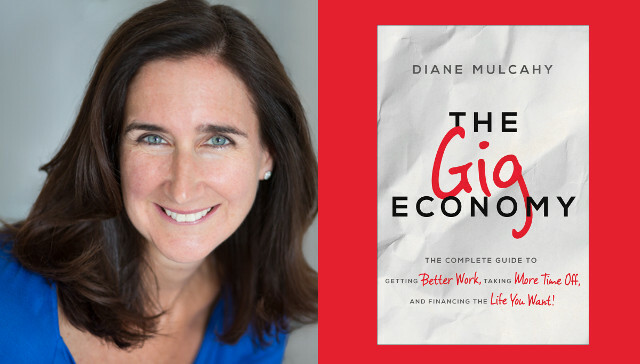 Five years ago, before it was even a thing, Diane Mulcahy created and began teaching an MBA class on The Gig Economy at Babson College. The class gained immediate traction and was named by Forbes as one of the Top 10 Most Innovative Business School Classes in the country. Her book The Gig Economy is a guide to the world of short-term jobs, contract work, consulting projects, and freelance assignments. Diane is an active and enthusiastic participant in the Gig Economy. In between full-time jobs and consulting gigs in private equity and venture capital, Diane has been a Visiting Fellow at Trinity College in Dublin, an Executive-in-Residence at Babson College, and an Eisenhower Fellow. She has taken two different years off to travel around the world. Diane is currently an author, an Adjunct Lecturer at Babson College, and a Senior Fellow at the Kauffman Foundation. Diane holds undergraduate and graduate degrees from Harvard University. She lives in Boston with her husband Kevin. 1MFWF: The term “Gig Economy” is still new to many people. Does it describe a fringe part of the workforce? Is it a fad? Diane: My definition of the Gig Economy is quite broad. It basically includes everyone who is not a full-time employee in a full-time job. If you are a consultant, contractor, freelancer, part-time worker or on-demand worker, you’re part of the gig economy. The Gig Economy encompasses many professions, multiple sectors of our economy, and crosses income levels. Platforms like Axiom, Topcoder, and HourlyNerd provide options for skilled professionals like lawyers, programmers, and mba graduates to find contract work. Adjunct lecturers (of which I am one) are highly educated and experienced while Uber and TaskRabbit are accessible to just about anyone, regardless of education or experience. The Gig Economy is not just a fad—it is here, growing quickly and showing no signs of reversing. Several of the drivers of the Gig Economy appear to be permanent. First, companies are adding fewer jobs to our economy because they are increasingly separating ‘work’ from a ‘job.’ The example I like to use is that there is plenty of freelance writing ‘work’ available, but not many full-time reporter ‘jobs’. Companies are disaggregating work from jobs, and creating fewer jobs. Second, employees are increasingly the worker of last resort. Full-time employees are the most expensive and least flexible form of labor, so companies will seek to automate, outsource, offshore, or contract out work before they will hire a full-time employee. Finally, more and more workers are choosing to work in the Gig Economy—they prefer the control, autonomy, and flexibility they have over their work and their lives. 1MFWF: Is the Gig Economy only beneficial to high-wage, skilled workers, or can it have benefits for low-skill workers as well? Diane: The Gig Economy can be beneficial to both high-wage skilled workers and low-skill, low-wage workers. Highly skilled workers are certainly the best positioned to take advantage of the many opportunities the Gig Economy offers—they have the chance to move from good jobs to great work by putting together a portfolio of interesting, challenging, and well-paid work that gives them flexibility and control over their schedule. Low-wage work doesn’t disappear in the Gig Economy—it is the persistent bane of our economy and society. But, low-wage workers have the chance in the Gig Economy to move from ‘bad jobs’ (ones that are poorly paid, offer no benefits, and offer no control over their schedule) to better work. The example I like to use is a taxi driver. They are not well paid, don’t have access to benefits, and have to work in shifts defined by someone else. They are in bad jobs. In the Gig Economy they can become uber and lyft drivers—still not well paid, without access to benefits, but with control over their schedules, which makes a material difference to their quality of life and allows them to better manage their professional and personal lives. It’s why people who wouldn’t dream of getting a job as a taxi driver are willing to become Uber drivers. As with our traditional jobs economy, there are winners and losers in the Gig Economy based on individual circumstances—it is not a panacea for workers, nor is it ruinous. 1MFWF: Currently, the Gig Economy requires significantly more self-reliance than the traditional workplace model—not just for crafting a new type of career, but also for managing health care, disability insurance, life insurance, and so on. Is it possible for us to have both the freedom of fluid careers as well as the security of stable benefits and protections? Diane: In the U.S. we have structured our labor market to essentially penalize people who are not full-time employees. Once you are not a full-time employee, you immediately lose benefits and protections which we have made only available to those who have a full-time job. This needs to change so that we create a labor force that protects all workers, no matter how, how much, where or when they choose to work. In terms of benefits—it is absolutely possible to create a benefits package as an independent contractor. The Affordable Care Act has made health care accessible to everyone in the workforce by separating healthcare insurance from full-time jobs, and subsidies help make it affordable. Disability and life insurance can be purchased on the private market, although without the benefit of the regulated and subsidized market that we have for health insurance. Independent workers are actually better off when it comes to saving for retirement because they can save so much more and much faster than employees. A high-earning independent worker can establish their own individual 401k and save over $50k per year, whereas employees are limited to $18k per year plus an employer match (which is usually capped at 2-3 percent of salary). Independent workers can also have an IRA, just like employees can. 1MFWF: One of the upsides of a gig-oriented lifestyle is the (theoretical) ability to take time off when you want to—presumably leading to a better so-called work/life balance. But one of the downsides is feeling like you can never refuse work in case the offers dry up, and so never actually taking planned time off as a result. Is it likely that insecurities like that mean the Gig Economy will lead to a more harried and stressed workforce, rather than one with better balance? Diane: Certainly in the beginning of any new work situation, whether a job, a gig, or starting a new business, the tendency is to limit time off until you’ve proven yourself and understand the full requirements of what it takes to be successful. I think that tendency exists in both our traditional jobs economy and in the Gig Economy. In interviews I conducted for my book, people who had been in the Gig Economy for some time absolutely took time off—and generally more than employees (who, many surveys report, fail to take their full vacation time). I hear many more stories of people in the Gig Economy taking chunks of time off (e.g., a month, the summer, the holidays) than employees. With planning, and a sense of when your income naturally ebbs and flows, most people in the Gig Economy can also identify their normal ‘slow’ times of year, and take advantage of those by taking more time off. 1MFWF: The traditional “American Dream” involves owning a home and a car, working a stable job to provide for a family, and enjoying a comfortable retirement. Will the rise of the Gig Economy mean the end of this dream? Diane: The traditional American Dream certainly looks less appealing in the Gig Economy. The home and the car are expensive purchases that require debt, and the ability to pay fixed costs every month. In a Gig Economy of more variable income, we’re seeing more people choose to access rather than own their lifestyle—it is more financially flexible, requires less debt, and provides more freedom. The example I like to give is myself. I live in a city and haven’t owned a car in 10 years—I access my transportation via Uber, Zipcar, the subway, hubway bikes, and walking. It is cheaper, more flexible, and requires no debt, and no fixed monthly costs that i have to cover by earning income. I believe the American Dream is evolving in a way that allows people to access the lifestyle they want rather than go into debt to own it. I covered retirement in the benefits question above. In the traditional jobs economy, companies aren’t providing pensions or retiree health coverage anymore—those are artifacts of a different time. Whether you work in a full-time job or in the Gig Economy, you are responsible for saving for your own retirement. I also think there is a trend towards focusing more on time and experiences rather than material goods. The emphasis of the new American Dream is quality of life, not quantity of stuff.